Marked is the first novel in the House of Night series written by P.C. Cast and her daughter, Kristin Cast. As a years-long, die-hard fan of L.J. Smith's The Vampire Diaries, I typically tend to shy away from most other teen vampire series (because I'm just never satisfied!). But after having purchased the first several books in the House of Night series for a bargain, I decided to give it a whirl. In an alternate reality created by the Cast duo, "vampyres" have always existed. Select teenagers become fledgling vampyres after being "Marked" with colorful tattoos on their faces by some mysterious higher being. 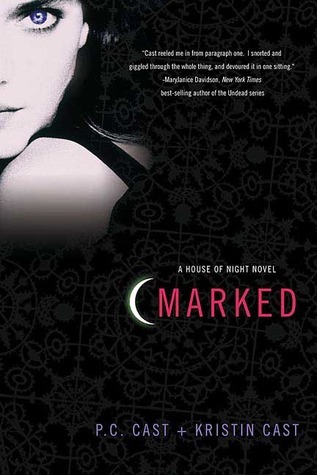 After they become Marked, teens are removed from public school and sent to a boarding school known as the House of Night, where they're trained to embrace and understand the ways of vampyres. Zoey Redbird is a seemingly normal 16-year-old girl who has just been Marked. Shortly after the mark appears on her forehead, Zoey visits the farm where her Native American grandmother lives to seek advice from her spiritual and open-minded Grandma. There, Zoey experiences a spiritual encounter with the revered vampyre Goddess Nyx, who deems Zoey "special," according to Zoey's hazy dream. Later on, after enrolling at the House of Night, Zoey learns that her vampyre powers and intuition is far more advanced than those of her fellow classmates. Throughout the rest of the novel, Zoey manages to make both friends and enemies at the House of Night, and struggles with embracing her destiny as the next new vampyre Goddess. Marked isn't at all difficult to get into; I was sucked right in. I breezed through Marked within two or three days; it was just that good. The teenage banter in Marked is cute and funny -- not too over the top as I find many teen novels to be these days. The novel opens with Zoey and a high school girlfriend talking about boys by their lockers, when suddenly a vampyre "marks" Zoey with the tattoo. Realizing she's either about to become a vampyre or die during the transition to become one (known as the "Change,") Zoey begins freaking out, but ultimately succumbs to her destiny. At the House of Night, Zoey embraces her new studies with aplomb, and forges new, healthy relationships with a close-knit and trustworthy group of classmates. The end of Marked sets up the story for the second book in the series called Betrayed, and has Zoey preparing for life with her strong, newly developed vampyre talents. I'm thrilled to have the next four books of the House of Night series on deck! I'm excited to see how Zoey's character develops and becomes stronger.